At the Ft. Walsh National Historic Site, a group of costumed interpreters gather in front of a log cabin. The group can be seen between two spokes of a Red River cart. The costumed interpreters act out historical events of the site. the Ft Walsh National Historic Site is part of the Cypress Hills Interprovincial Park. 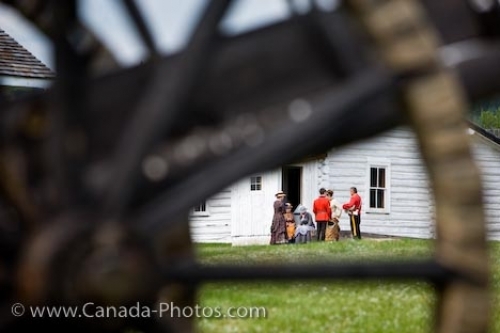 Looking through the wheel spokes of a Red River cart at a group of costumed interpreters gathered outside a building at Fort Walsh National Historic Site, Cypress Hills Interprovincial Park, Saskatchewan, Canada.